At work the other day, I was thinking about what it might be like if London's buses were still entirely run by TFL. East Thames is the most recent example of a truly publicly operated service, I have been looking online but there's not a great deal of information on there. I was wondering if there are any staff on here, what was ETB like to work for, and how did it compare working for a private operator? Were the structures of management, operations and so on different? Did ETB answer to LBSL like all the private companies do for mileage, service quality etc? Forgive me, but what's East Thames Buses? I'm quite young. Actually it's my 15th birthday today. Now I can watch Lucy in the cinemas. When the first Mayoralty was established a decision was taken to establish an internal (i.e. owned by TfL) bus company. There were two reasons for this - one as an operator of "last resort" which could step in when an operator failed and TfL didn't receive economic bids to take over the failed services. The second was to have a "public sector comparator" so that TfL knew how much it cost to run things. TfL also expected to be able to perform better than private sector operators - "to show them how it is done". There were two significant operator failures - Harris Bus that ran routes south of the Thames and in Ilford and London Easylink which collapsed when the directors defrauded the company. TfL tried to get other operators to take over the Harris Bus routes (108, 128, old 129, 150, 132, 180, 661, 669) but no affordable bids were received. Harris Bus had seriously underestimated the cost of running TfL routes and that contributed to their collapse. TfL took over the vehicles and staff and former East Thames Buses to run them. London Easylink was set by Durham Travel Services and ran the 42 and 185. After the operation collapsed temporary arrangements were put in place by the old Blue Triangle to run the 185 with a mass of hired in vehicles from operators all over London. After months of this arrangement the route was placed with East Thames Buses. Route 201 ended up with East Thames because Mitcham Belle and then Centra collapsed / withdrew from London work. There were a number of badly performing operators in those days as well as company collapses. 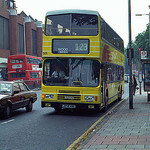 In 2005 route 1 moved to East Thames Buses but I forget what route was swapped with it. The new administration under Boris Johnson decided it no longer wanted to retain East Thames Buses so sold off the operation, with renewed contract terms, to London General. This is why the routes in question have an odd variety of Volvo B7TLs and DAF (Volvo Merit) single deckers and why there has not been much variety with some of these routes. The Ilford routes were restructured into today's 128 and 150 (the 129 was withdrawn) and successfully retendered. The general impression was that East Thames Buses failed in its key objective of being better than the private sector operators. Its performance certainly wasn't better and the general state of the fleet in its latter years was pretty poor. Happy to be corrected by those who wish to correct the above. I can't guarantee I've got it all correct. TfL took on the 1 with First taking the 150 and Arriva taking the 128 and 393. By then the 129 had been withdrawn, with the 128 being extended to Claybury Broadway and the 150 to Becontree Heath- the old 129 ran between Claybury and Becontree Heath. I believe the 393 was operated by ETB as there were no suitable bids at the time when the route was introduced. The East Thames Buses take over of the 185 was a more drawn out process, starting with 5 Volvo Olympians as part of the Blue Triangle schedule and gradually increasing over a couple of months to a full ETB operation. Operationally wise, they didn't really come across as the most fantastic of operators with fairly regular single deck workings on double deck routes and often came pretty low down on the TfL performance league tables. I think most things have been answered already, but couple more points on the operator of last resort. The Mitcham Belle collapse had shown it didn't really work anyway, they had a route running to Richmond which was miles from any ETB garage and if the buses were leased, the finance company gets them so it was easier to get another operator to run a short term emergency contract. Was known as Extremely Terrible Buses due to the crap service they provided. I use to use the 180 at 05.30 in the morning from Abbey Wood at the time, and when I complained to TFL about the bus always being 10-15 minutes late and missing my connection they replied that it was down to traffic in Greenwich...... My reply of you must be having a laugh as there is no traffic in Greenwich at that time of day and I knew the bus came from the depot at Belvedere did not go down to well. Or my suggestion that perhaps there drivers were drinking tea instead of leaving on time. I quite liked East Thames Buses although their seat interior was ugly as hell but I wasn't a fan of them doing a DT i.e constantly putting single deckers on double decker routes. A bit of an exaggeration to suggest they did it constantly - it happened but not as frequently as DT or even Metrobus. It's an Optare Excel, an early low floor model which didn't seem to last very long in London. Drivers quite liked them surprisingly. As already said it's an Optare Excel - Trent Barton in Derbyshire / Notts like them a lot. And one from Harris Bus on the 108. East Thames took over the 108 from Harris Bus. London had some very weird Excels - short ones with dual doors that ran on Route 211 (not my photo). Thank goodness they were banished as the overloading was awful at peak times and the seat layout was bizarre. A Metrobus driver told me years ago that when they were working they had a good turn of speed good vision and were quite comfortable to drive. They are still with us in spirit because a Tempo in just an Excel in a better dress LOL.